Mount Vernon Music Association is a 501(c)(3) charitable organization dedicated to providing outstanding performances of live music to communities primarily in northeast Texas. We present concerts of traditional chamber music, jazz and other styles as well as educational and family concerts, and programs for nursing homes, encouraging interaction of the performing and visual arts. The mission of Mount Vernon Music is to provide and develop the appreciation for high quality performance of live music in East Texas. East Texas Giving Day, April 30, but you can already pledge a gift to Mount Vernon Music! With your help, we will commission a new piece for quartet to take into schools, because music has the power to tell stories and expand the imagination. AND, thanks to a generous fund holder at the East Texas Communities Foundation, gifts up to $2,500 will be doubled! Visit EastTexasGivingDay.org. There are quite a few incentives to give at certain times. Please look at the Prizes Master List. The more donations come in the greater our chances to winning a prize! Whenever you shop online with Amazon Smile, a portion (.5%) of each purchase price will go to MVM, and it couldn’t be easier! Just sign in at smile.amazon.com and designate Mount Vernon Music as the charity of your choice. Your shopping will support our work to keep sharing music in Northeast Texas. Thank you! or buy it at Amazon (German/English version). In 2015 Mount Vernon Music commissioned a piece for children from composer Benedikt Brydern for use in outreach performances in East Texas schools. Based on the Grimm’s fairy tale The Bremen Town Musicians, the work was made even more accessible to children by the addition of illustrations by artist Madeline Crist. 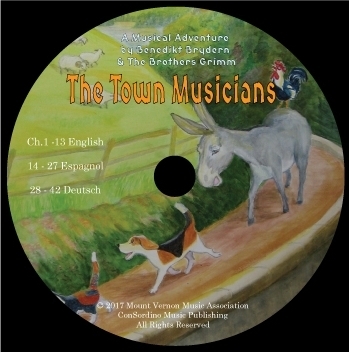 Brydern’s The Town Musicians, A Musical Adventure for narrator, flute, violin, viola and cello was premiered in June 2015. Since then MVM has taken it into many schools, performing it for thousands of young listeners. The impression this piece makes on children who otherwise have no opportunity to see orchestra productions (e.g. Peter & the Wolf) is profound. 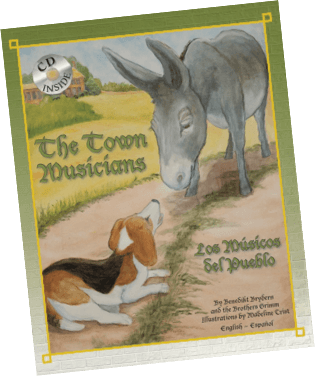 In order to share this delightful music with as many children as possible, MVM created a bilingual book and CD in English and Spanish, and a version in German and English. 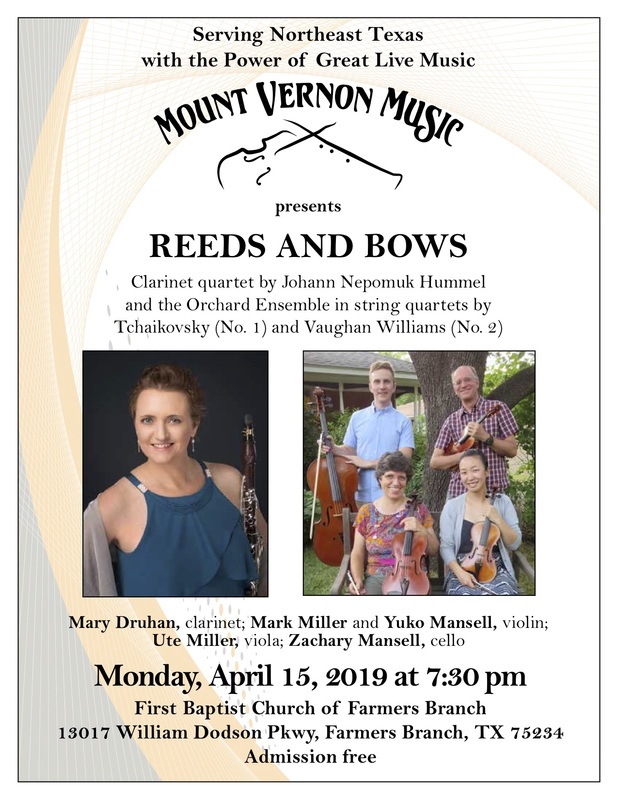 These recordings pair Mount Vernon Music’s own Orchard Ensemble with narration by professional Hollywood actors Will Ryan, Elke Sommer and Jordi Caballero. 1.) Mount Vernon Music Association (MVM) will continue to be a recognized and highly respected arts organization in the region, the state and the country. 2.) MVM will continue to be a cultural ambassador, bringing a wide range of musical styles through the creation and sharing of music of the highest quality to audiences who might not otherwise have an opportunity to hear it. 3.) MVM will continue to explore, celebrate and preserve our rich musical heritage from diverse cultures by presenting varied combinations of ensembles, instruments, and ethnic musical traditions. 4.) MVM will continue to support and expand a broad base of music lovers, bringing beauty and harmony into the communities we serve. 5.) MVM will be a catalyst for a vibrant arts community in East Texas. MVM will promote appreciation for arts and culture by presenting programs involving the performing and visual arts. 6.) MVM will build future audiences through educational programs, performing opportunities for young artists, and scholarship support.